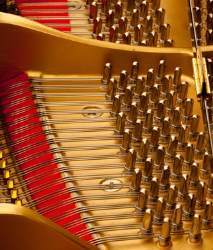 When a piano is manufactured, its pitch level is set at Concert Pitch, meaning that A=440hz. Most pianos are not at 440 because they have been neglected, thus their absolute pitch may be somewhere between 440 and 400. Having an instrument at Concert Pitch means that the instrument will have a certain brilliance in the sound and it would easily be able to be used in ensemble playing. Another circumstance where this could matter is if you want to sell the instrument. If the buyer discovers that the instrument is not at Concert Pitch, he/she may renege on a purchase. If ensemble playing, sound picture or worrying a future buyer do not matter to you, pitch raise is not an issue. If your instrument qualifies for a pitch raise (torque resistance on the tuning pins being the decisive issue), it usually requires 3 tunings within a 2-month span.